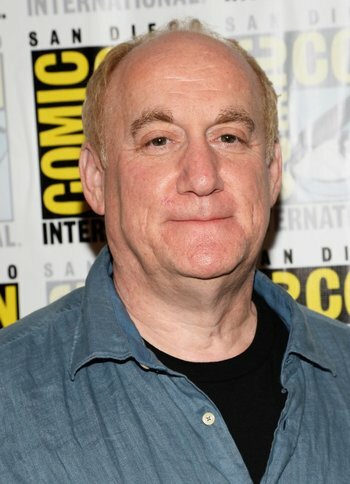 Joseph "Jeph" Loeb is a comics/film writer and TV producer. He started as a co-writer of Teen Wolf, then wrote Commando and a few other movies. While working on the script for The Flash movie, he got an opportunity to write for DC Comics. The most acclaimed stories from his first foray into comics were the critical hits Batman: The Long Halloween (one of three titles that were inspiration for Batman Begins), Batman: Dark Victory and Superman for All Seasons, which he created with artist Tim Sale. Later, also with Sale, he wrote three mini-series for Marvel Comics, Spider-Man: Blue, Daredevil: Yellow, and Hulk: Gray each telling early stories of the title characters, revolving around their relationships with now dead Love Interests (respectively Gwen Stacy, Karen Page and Betty Banner). One of Loeb's greatest successes was bringing his children — Sam and Audrey — into comics. Loeb was also a producer and writer for Smallville, Lost, and Heroes. Back at DC, he created Batman: Hush with Jim Lee and started the latest Superman/Batman ongoing series. He got multiple awards, including the Eisner Award for a Batman and The Spirit crossover. But then later, his son was diagnosed with cancer, and then later died at the age of 17 after a three-year battle. Jeph, who had already left Smallville to take care of Sam, finished his son's last comics story together with many writers and artists, and published it in Superman/Batman. Then he decided to retire from comics. However, his friend, Marvel Editor-In-Chief Joe Quesada, convinced him to come back and write for him. But Jeph, understandably, wasn't the same man he was before. While his titles always had flaws — Critical Research Failure and Continuity Snarl among others — after coming to Marvel, his work was quickly criticized by many fans as some of the worst in living memory. Fallen Son: The Death of Captain America, where superheroes come to terms with the death of Captain America is considered the best of these recent works. His runs on Wolverine and Hulk are infamous among most fans for introducing two villains who, confusingly, predate the origins and adventures of the main characters — Romulus and Red Hulk. His run on The Ultimates has been labeled as full of Character Derailment and Ultimatum is generally considered to rival Countdown to Final Crisis, Amazons Attack, and Justice League: Cry for Justice in terms of quality. He was also forced to leave Heroes because NBC didn't like the course of the story (and because according to some, Loeb was stealing series writers for Ultimate Marvel). Loeb has since taken over as the head of Marvel's animated division, acting as an executive producer for Ultimate Spider-Man and the second season of The Avengers: Earth's Mightiest Heroes!, the former of which has developed a serious Broken Base. He is also producing Hulk and the Agents of S.M.A.S.H. and Avengers, Assemble!, the latter of which is heavily influenced by Joss Whedon's The Avengers film. He also oversees the television division of the Marvel Cinematic Universe, executive producing Marvel's ABC shows (Agents Of Shield and Agent Carter), as well as their Netflix ones (Daredevil (2015), Jessica Jones (2015)). His recent run on Nova has been fairly well-liked. He shares his workplace with Geoff Johns and Allan Heinberg. Animation Age Ghetto: He admittedly believes in gearing Marvel cartoons to children, hence his efforts to invoke this with the single-episode storylines and comedic overtones of Ultimate Spider-Man and Avengers, Assemble!. Loeb: (...)The reality is that we're on a network, Disney XD, which is largely known as being a kids' network. We're not going to shy away from that. We want to be able to bring that audience in, because in many cases, it's going to be their first opportunity to get to know the Marvel Universe. And that's a pretty big thing. We want to be able to share our universe with the next group of Marvel fans, however they're going to come in. Our movies, believe it or not, are PG-13. While everybody can and should go to them, there are families out there who feel like maybe they're a little too old. What we wanted to do is create an opportunity where it absolutely is a four-quadrant: We want women, we want families, we want kids, and we want men to be able to watch the show. But if at the end of the day, the good news that we get is, every single kid in America is going to be watching the show, and throughout the world? I'll take that. Beyond the Impossible: What Red Hulk's doing is, in a nutshell, this trope gone wrong. An example is lifting Thor's hammer without being worthy. Creator Cameo: Well, not quite the creator as much as his children. Especially noticeably in one instance where Iron Man talks about "a brave little boy named Sam." and the newest Nova, Sam Alexander. Does This Remind You of Anything? : Our Worlds at War came out in the middle of 2001. By the end of the story, it is in many ways The DCU's 9/11. Gadgeteer Genius: Hiro "Toyman" Okamura (who may have inspired Hiro Nakamura on Heroes). Idiosyncratic Episode Naming: He wrote four series for Marvel titled Daredevil: Yellow, Spider-Man: Blue, Hulk: Gray, and Captain America: White. Together, they form a Thematic Series. In Superman/Batman, both leads ponder on the plot and each other at least once every single page. In Supergirl's first arc the titular heroine constantly reflects on her adoptive homeworld's strangeness and her own feelings of inadequacy. Kicked Upstairs: In regards to his promotion as Marvel's Head of Television. The Lost Lenore: Even before the loss of his son Sam, Loeb's work heavily dealt with loved ones no longer living. Rogues Gallery Showcase: Loeb's work on Batman, Hulk, Spider-Man: Blue, and Daredevil: Yellow all feature an abnormally diverse collection of the hero's villains, often organized under a single mastermind behind the scenes. In Superman/Batman: Public Enemies, Bats dresses up as Hawkman and Supes as Captain Marvel. Actually kind of disturbing if you think about it; they had to undress Hawkman and Captain Marvel, even more disturbing is the fact that Captain Marvel is essentially a kid inside a grownup's body. In Batman And The Spirit, Bats and the Spirit switch costumes. In Onslaught Reborn, Wolverine disguises himself as Hawkeye. An unrelated but equally noticeable style of his; when he creates a new villain, that villain will be inserted into the past of the hero, and will instantly have deeply personal relationship with the hero to the point of becoming their new Arch-Enemy; Hush, Bruce Wayne's childhood best friend (who had never been mentioned before), Romulus, who had secretly been manipulating Wolverine all his life. Red Hulk subverts this trend by being revealed to be longtime Incredible Hulk supporting character General Thunderbolt Ross the whole time. His "Colors" series with Tim Sale all go by the same formula of a hero (Spider-Man, Daredevil, Hulk, Captain America) remembering a simpler time in their career (complete with the art style generally reflecting that time period that said era was published) from the perspective of modern times with the spectre of a dead loved one (Gwen Stacy, Karen Page, Betty Ross, Bucky Barnes). In Hulk and Daredevil, the titular color is also a reference to their early appearance.